Let’s face it, email marketing is not dead. The rise of social media in influencing customers’ decisions to buy online and in-person has not removed email marketing from the equation at all – in fact, it’s almost enhanced it. Customers who make purchases through an email marketing campaign spend nearly 138% more than customers who don’t make purchases through an email campaign at the same business – and it’s a great way to encourage customer retention. If a customer receives email marketing campaigns regularly with deals, information, and things that they want to see, they’ll stick with you. It’s a valuable investment in resources and time, so it’s best to get on the email train as soon as you can. So who’s doing a great job when it comes to email marketing to grow an online brand? There are several key qualities that all of the top dogs in the email marketing world are doing that are important to remember and adopt for your own brand. Here are five examples of great brands who are succeeding when it comes to email marketing. Uber does their email marketing campaigns just like you’d want your next meeting to go: short, simple, and straight to the point. This popular ride-share app lets you know exactly what you want to know right away – here’s the discount, here’s what it means for you, and here’s how you get it. Readers can skim the email, decide if it’s something they want, and if they do, keep reading, and if they don’t, delete. The call to action is prominent, up front, and there’s no gimmicks attached – it’s valuable for customers to feel like they’re having a transparent experience with a company and that they’re not being duped by a scam, something that’s all too common in email marketing. It’s important to remember the customer experience when designing your next email marketing campaign. Sure, you can create something fancy and complicated that you spend thousands on, but will it be easy to understand, desirable for customers, and make sense? Maybe not – it might be more valuable for you and your business to create an email marketing campaign that’s direct and to the point, and easily scannable enough for customers to be able to skim through in a matter of seconds to determine if they want to make a decision or not. It’s worth testing out in your next campaign. 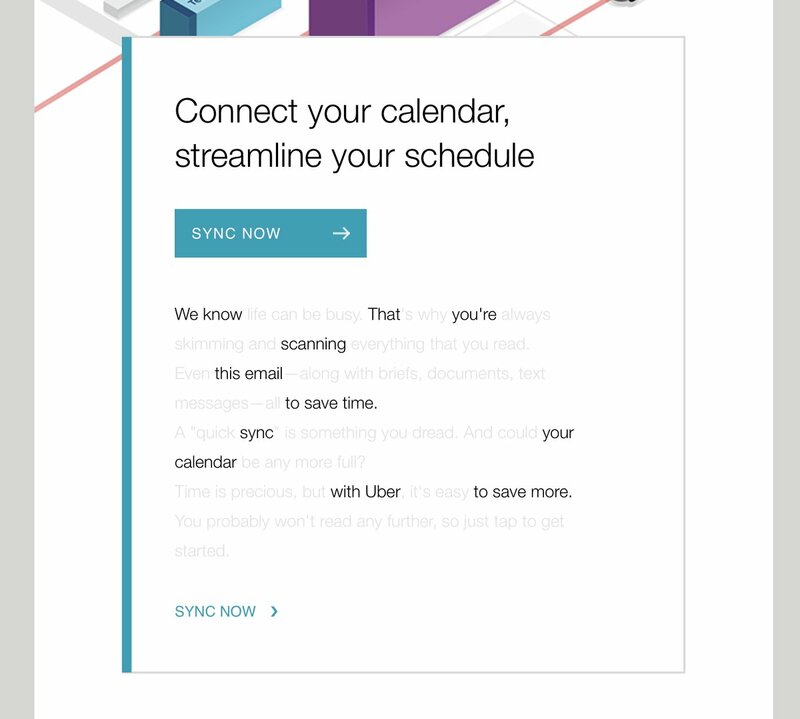 Check out this example for how Uber’s created a scannable, simple email for customers. The Skimm is news website that’s popular with millennials and folks who want an easier way to skim through the news in a digestible way. What started with a Gossip Girl style e-newsletter turned into wildly popular business that includes an app, a calendar, and a very popular website that’s helped over four million subscribers read and understand the daily news. So how do they do it? They keep it short and sweet – and entertaining. 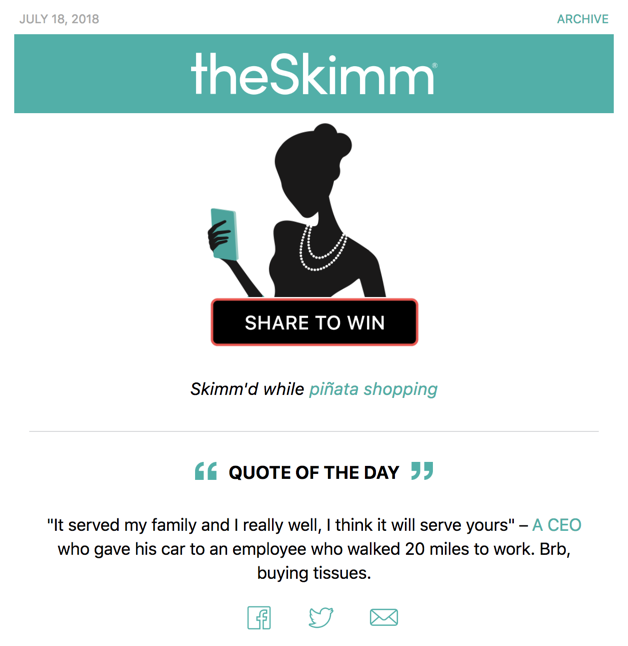 Hence, the Skimm – content you can skim through. Their emails always have a fun header image that stays on top of the seasons and current events, and a prominent link to invite friends to subscribe. Then, they go into the daily news for the day, filled with links and references to products and events that they’re probably getting lots of dollars for, and entertaining content that’s trendy, gossipy, and turns something that’s boring and dreary into a fun, engaging experience. The skinny on their success? The utter simplicity and ease with which they’ve solved a major problem – most people don’t want to read the news, or don’t have time to. So, they’ve created a great solution and kept it as simple as it can be. And, the statistics prove it – 73% of millennials identify email as their preferred means of communication. Oh, the power of a good photo. 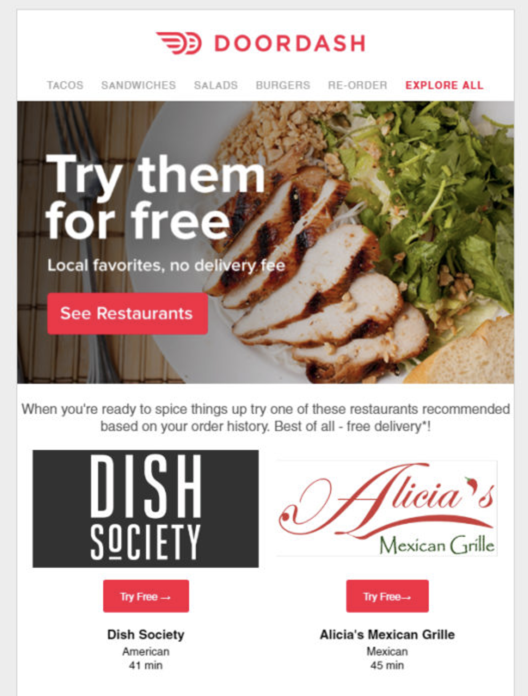 DoorDash uses imagery that really draws customers in – thick, gooey grilled cheese sandwiches, tempting plates of nachos, or steaming bowls of pad thai just staring at you from your inbox. We all know great imagery works – DoorDash is just using that to make sure people say “wait…I am pretty hungry” and make a purchase. It’s important to also make sure that you’re giving your customers what they want – if they’re on the fence about completing an order, there’s nothing like a strong visual to convince them to go through with it. And, in their campaign, they also let customers know how long it’ll take to deliver their order, which restaurants are “trending” right now, and it bases their recommendations off of previous orders. There’s no better way to draw customers in than with a personalized experience that provides great visuals and the exact amount of information that they need in order to make a well-informed decision. Adidas does a great job of personalizing their email marketing campaigns to match up with their customer base. It’s simple – customers get emails based on their reported gender, and only see the type of clothing, shoes and accessories that they want to see. Instead of getting a hodgepodge of clothing and shoes that’s meant for anyone, subscribers get a more personalized email that fits more with what they’ll actually be shopping for. Ever been annoyed by a promotional email that you received that didn’t really have anything that you’d ever purchase in it? That’s a common experience for customers, and one that can be solved by segmenting your campaigns. And, segmenting your lists doesn’t have to just be by gender – you can segment by location, age, or any other demographics that users input into your system. This way, subscribers only get the type of content that interests them. For more examples of great email marketing campaigns that utilize all of these great traits – and more – click here. It can be valuable to learn from others within your industry, or far outside of it, and what they’re doing to attract and retain customers. 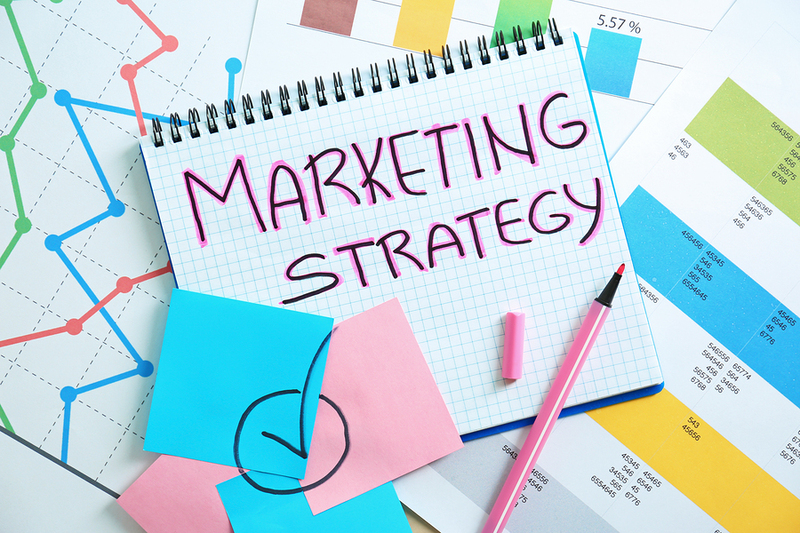 Now that you’ve had the opportunity to read through some of the best practices and marketing methods being used by top brands in the world today, it’s time to implement these same methods into your own brand or business. One of the best ways to get started is to focus more time and effort on your mailing list. Contact AfterOffers today to get started with your own 100% opt-in email marketing lead generation campaign. Not only will your list size grow on a daily basis, you will be thrilled with the high-quality of leads that will be delivered through our permission-based marketing platform.